Does an alignment like this occur only once in a blue moon? No, although it was during a blue moon that this single-shot image was taken. 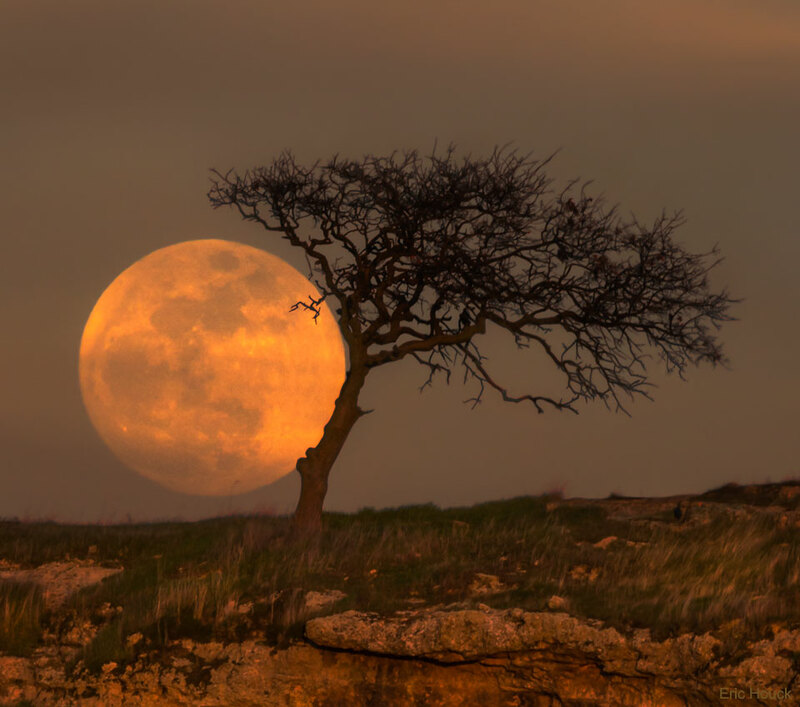 During a full moon that happened to be the second of the month — the situation that defines a blue moon — the photographer created the juxtaposition in late January by quickly moving around to find just the right spot to get the background Moon superposed behind the arc of a foreground tree. Unfortunately, in this case, there seemed no other way than getting bogged down in mud and resting the camera on a barbed-wire fence. The arc in the oak tree was previously created by hungry cows in Knight’s Ferry, California, USA. Quirky Moon-tree juxtapositions like this can be created during any full moon though, given enough planning and time. Another opportunity will arise this weekend, coincidently during another blue moon. Then, the second blue moon in 2018 will occur, meaning that for the second month this year, two full moons will appear during a single month (moon-th). Double blue-moon years are relatively rare, with the last occurring in 1999, and the next in 2037. Posted on Wednesday, 28 March 2018 by VGC	This entry was posted in ifttt-photograph and tagged IFTTT, NASA. Bookmark the permalink.